The NBA Season began earlier this week with some serious swag. The Boston Celtics pulled away from their biggest competition in the Eastern Conference, and the defending champion Warriors got bling of a historic nature! But know that it's back to the beginning, what can we expect this upcoming season? Join Christian Heimall on Press Row this week for a preview of the biggest storylines on the hardwood. Returning to the show is Brandon Robinson of Scoop B Radio and Basketball Society ... See More Online. He's made some waves with his thoughts on what could happen next summer, but what will happen this winter? Brandon gives his predictions for Rookie of the Year, Most Valuable Player, Biggest Surprise and eventual NBA Champion. Tune in for an entertaining and informative chat. All that plus your listener questions! 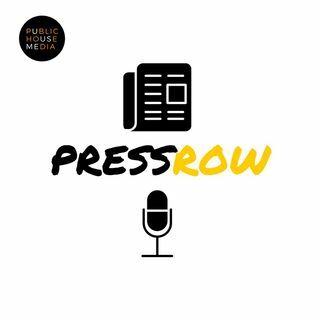 Don't forget to join the show by following us on Twitter (@PressRowPHM), Instagram (@PressRowPHM), or Facebook (Press Row by Public House Media) to stay up to date with the 2018 Podcast Awards nominated Press Row! You can also subscribe, rate, review, and share on iTunes, Google Play, and more! Join Christian in sporting some awesome Press Row gear by visiting our store at www.thePHmedia.com.